Agaricus bisporus is one of the most consumed culinary mushrooms in the world. The white type of Agaricus bisporus has been demonstrated with various bioactivities beneficial to human health. However, little was known about its brown type. In this study, the anti-cancer and immunoregulatory potential of Agaricus bisporus (brown) polysaccharide were investigated in vitro and in vivo. In vitro, the polysaccharide had a significant antiproliferative effect on Hela cells (cervical cancer cells), especially at the high concentration of 200 μg/ml. The spleen index, thymus index and carbon clearance ability of mice were remarkably increased by the polysaccharide treatment, indicating the polysaccharide had a promising benefit for immunodulation in vivo. Furthermore, the polysaccharide increased the proliferation of RAW264.7 cells with 19.1% at 50µg /ml and 34.5% at 100µg /ml, which demonstrated the immunodulation mechanism was in close conjunction with macrophages. In conclusion, these results indicated that Agaricus bisporus (brown) polysaccharide possessed strong immunostimulatory and anti-tumor bioactivity in vivo and in vitro. Therefore, it could be explored as a novel natural antitumor agent with immunomodulatory activity. Journal of Food and Nutrition Research, 2014 2 (3), pp 122-126. Zhang, Yanqing, et al. "The Immunostimulatory and Anti-tumor Activities of Polysaccharide from Agaricus bisporus (brown)." Journal of Food and Nutrition Research 2.3 (2014): 122-126. Zhang, Y. , Ma, G. , Fang, L. , Wang, L. , & Xie, J. (2014). The Immunostimulatory and Anti-tumor Activities of Polysaccharide from Agaricus bisporus (brown). Journal of Food and Nutrition Research, 2(3), 122-126. Zhang, Yanqing, Guijie Ma, Leilei Fang, Lijuan Wang, and Junbo Xie. "The Immunostimulatory and Anti-tumor Activities of Polysaccharide from Agaricus bisporus (brown)." Journal of Food and Nutrition Research 2, no. 3 (2014): 122-126. Agaricus bisporus is one of the most commonly and widely consumed culinary mushrooms in European and America . It has been revealed that Agaricus bisporus contains various abundant nutritional substances, such as proteins , polysaccharides , fatty acids , vitamins , and phenols . Agaricus bisporus is divided into two types (white and brown) based on the color of its pileus. Although it is reported that the two types show similar macronutrients composition (contents of total sugars and total tocopherols), there is also considerable difference in chemical composition between them [2, 7]. In the recent years, much research has demonstrated that Agaricus bisporus (white) exhibit various biological effects, such as antioxidant , immunomodulating [9, 10], cancer preventive [11, 12], aromatase inhibiting [13, 14] and anti-hepatic steatosis . By contrast, few studies were performed to investigate the effect of Agaricus bisporus (brown) . It is still unclear whether Agaricus bisporus (brown) could exert the similar effects as the white type, especially in immunomodulation and anti-cancer. It is well known that polysaccharide is the main bioactive component of Agaricus bisporus [17, 18]. For example, (1→6)-β-D-glucans from the mushroom could present an obvious immunostimulatory activity, which contribute to the antitumor effects . In the present study, the anticancer potential of Agaricus bisporus (brown) polysaccharide extract was investigated with determining its antiproliferative effect on Hela Cells. In addition, the immunomodulatory activity was also investigated in vitro (murine RAW264.7macrophages) and in vivo (mice). Agaricus bisporus (brown) was from Jinsannong agricultural technology development company Ltd. (Tianjin, China), and the voucher specimen was deposited in the Department of Pharmaceutical Engineering, Tianjin University of Commerce. AB-8 macroporous adsorptive resin was from Nanda resin technology company Ltd. (Tianjin, China). D201 ion exchange resin was from Baoen adsorptive material company Ltd. (Cangzhou, China). Glucose was obtained from Troody technology company Ltd. (Shanghai, China). 3-(4,5- dimethylthiazol-2-yl) -2,5 - diphenyltetrazolium bromide (MTT) and Dimethyl sulfoxide (DMSO) was obtained from Sigma Chemical Co. (St. Louis, MO, USA). DMEM culture medium, fetal bovine serum (FBS), Trypsin-EDTA, and Penicillin-Streptomycin were purchased from Gibco/Invitrogen (Grand Island, NY, USA). All other reagents were all of analytical grade. The mushroom were freeze-dried and milled into 60 mesh particle size, then weighed (200g) and extracted with 5000ml distilled water (100°C) for 2h. The extraction solution was collected and centrifuged at 3000rpm for 15 min. The obtained supernatant was adjusted to be 10mg/ml (calculated as Glucose assayed with phenol–sulfuric acid method ). The columns (2.6 cm × 100 cm) of AB-8 and D201 were used for decoloration and deproteination of the crude polysaccharides solution respectively. After dialysis (molecular weight cut-off 10000 Da), the solution were freeze-dried, and the polysaccharide was obtained. The results of UV analysis showed that there was no absorbance at 280nm, which indicated that the proteins were removed totally with the procedure. Hela cells (cervical cancer cells) were obtained from Shanghai Institute of Cell Biology (Shanghai, China). The cells were cultured in DMEM medium containing 10%FBS and 100 IU/ml Penicillin-Streptomycin at 37°C in a 5% CO2 atmosphere. The experiment was performed at the logarithmic growth phase of the cells. RAW264.7 cells (mouse macrophage-like cell line) were also obtained from Shanghai Institute of Cell Biology (Shanghai, China), and were cultured as the reported method . 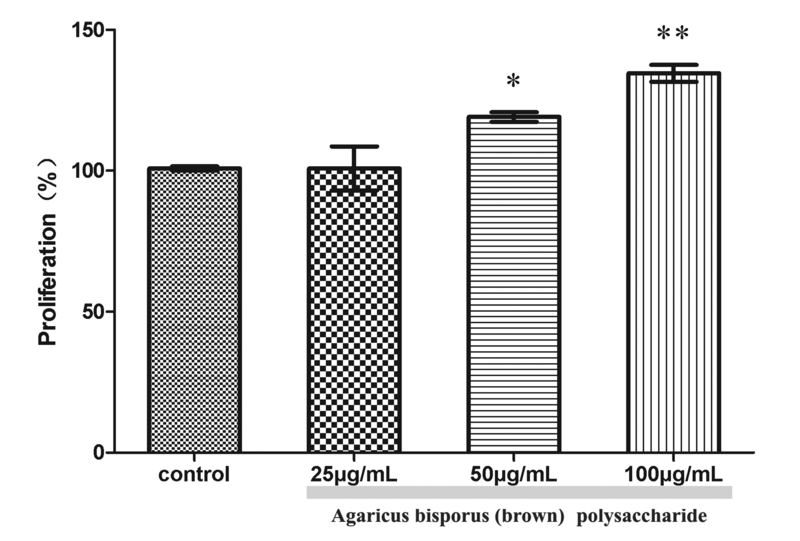 The effect of Agaricus bisporus (brown) polysaccharides on the proliferation of RAW264.7 cells was assayed with the same MTT method described in “2.2.2”. 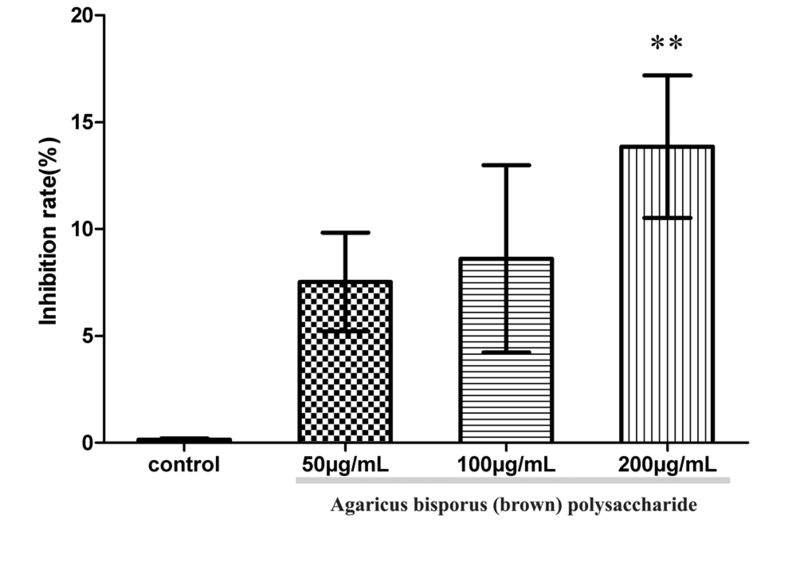 Different concentrations of Agaricus bisporus (brown) polysaccharides (0, 25, 50, 100μg/ml) were used evaluate the effect. All the experiments were performed 5 times and the relative proliferation rate was calculated as follows: relative proliferation rate (%) = (OD1/OD0) × 100% (OD1: sample; OD0: control). Kunming mice (4–5 weeks, 11-15g) were obtained from the Experimental Animal Center of Tianjin (Certificate No. SCXK 2010-0002). All the experiments were approved by the university animal care and use committee. The animal handling procedures were pursuant to the national guidelines for laboratory animals. The spleen and thymus indexes were assayed in accordance with previous reported method . 40 Kunming mice were randomly divided into four groups (10 in each group), i.e. control group (20 ml·kg-1·d-1 physiological saline), low dosage group (96mg·kg-1·d-1 polysaccharides), middle dosage group (120mg·kg-1·d-1 polysaccharides) and high dosage group (150mg·kg-1·d-1 polysaccharides). According to the grouping protocol, the animals were treated (intragastric administration) with the physiological saline and polysaccharides for successive 8 days, based on the body weights respectively. One hour after the last administration, the experimental mice were weighed and sacriﬁced by cervical dislocation. Then, the spleens and thymus were excised and weighted, respectively. Thymus index was calculated as the thymus weight / body weight (balanced before and after experiment), and spleen index was the spleen weight / body weight (balanced before and after experiment). A1 and A2 are the absorbance at 30s and 6 min, respectively . All data are expressed as mean ± S.E.M. The analysis was performed with one-way analysis of variance (ANOVA) and Student’st-test. Statistical signiﬁcance was considered when p value is less than 0.05. All statistical analyses were performed by SPSS 13.0 software. Hela cells (cervical cancer cells) were incubated 24 h in the presence of Agaricus bisporus (brown) polysaccharide at concentration of 0, 50, 100 and 200µg/ml. With the MTT method, the inhibition effect of the polysaccharide on growth of Hela cells was investigated. Just as shown in Figure 1, it was demonstrated that the polysaccharide exerted dose dependent toxicity activity on Hela cells, and 200µg/ml polysaccharide decreased the cell viability significantly (p< 0.01) with the inhibitory rate of 13.8%. Thus, Agaricus bisporus (brown) polysaccharide was presumably capable of inhibiting the growth of Hela cells. Much research has demonstrated that Agaricus bisporus (white) presents specific preventive effects on various cancers, including sarcoma , prostate cancer , breast cancer  and liver hepatocellular carcinoma . However, there are few previous reports on anti-cancer effect of Agaricus bisporus (brown). In the present study, the result verified the promising antiproliferative effect of Agaricus bisporus (brown) polysaccharide on Hela cells (cervical cancer cells) for the first time. To evaluate the immunoregulatory activity of Agaricus bisporus (brown) polysaccharide in vivo, the Kunming mice were administered with the polysaccharide for 8 days. Then, the spleens and thymuses were excised and weighted to determine the spleen and thymus indexes. 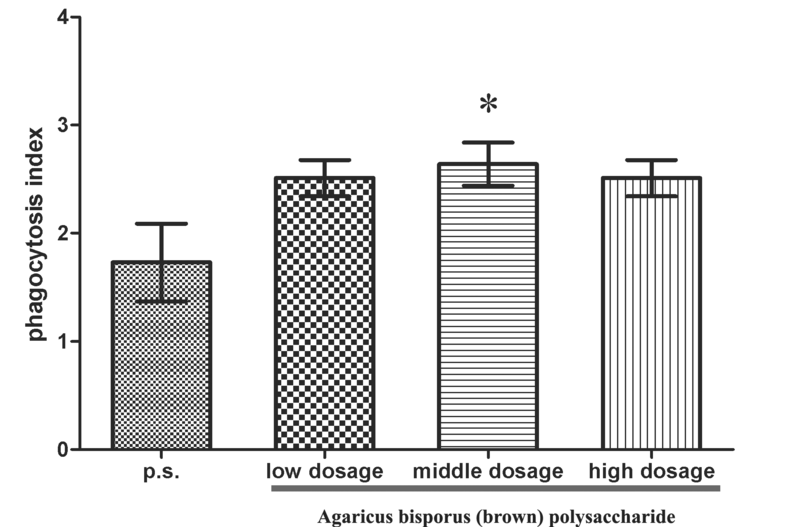 As shown in Figure 2, Agaricus bisporus (brown) polysaccharide exhibited a dose dependent improving effect on the thymus index and spleen index, especially at the high dose of 150mg·kg-1·d-1 (p<0.05) with significance. Moreover, the polysaccharide also exerted significant increase in carbon clearance ability (phagocytic index) at 120mg·kg-1·d-1 (p<0.05). However, this effect was not dose dependent (Figure 3). The results indicated that Agaricus bisporus (brown) polysaccharide had a predictable benefit for immunodulation in Kunming mice. The anti-cancer effect is traditionally postulated to be not only pertinent to the direct effect on cancer cells, but the ability of modulating immune system function [10, 17, 25]. Spleen and thymus are the main immune organs, and their indexes can reflect the condition of immunologic function [26, 27]. The main function of thymus is producing T-lymphocytes (T cells), which are critical cells of the adaptive immune system and responsible for cellular immunity. Spleen possesses plentiful macrophages and lymphocytes, in which B cells are in a large proportion and closely associated with the humoral immunity. 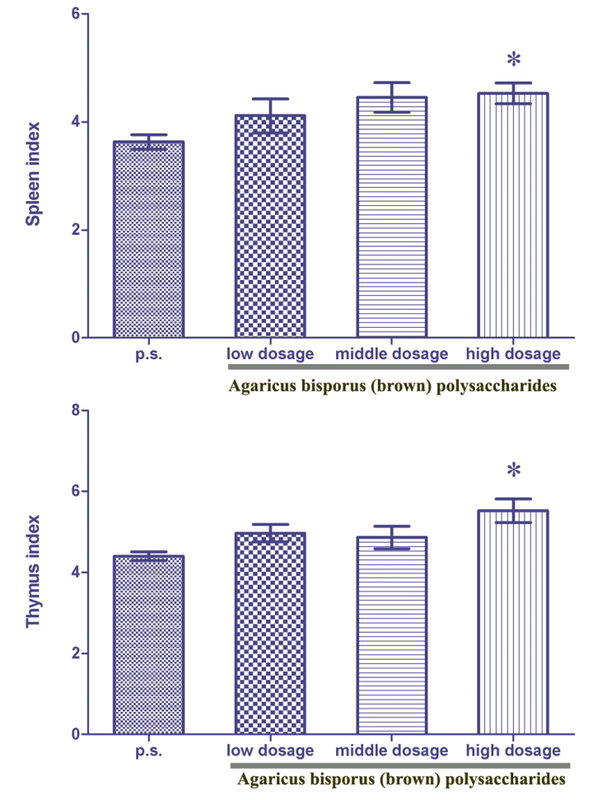 The present study manifested that Agaricus bisporus (brown) polysaccharide could increase the spleen and thymus indexes significantly, indicating that the polysaccharide played a crucial role in immunostimulatory activity. Phagocytosis is a vital immune defence process in which leukocytes engulf malignant cells, pathgenic microorganisms, tissue debris and inorganic particles . In this study, the carbon clearance test was performed to evaluate the phagocytosis effect of Agaricus bisporus (brown) polysaccharide in mice. As the carbon particles came into the systemic circulation, it would be cleared up by reticuloendothelial system involving phagocytes. The results showed that Agaricus bisporus (brown) polysaccharide increased the phagocytic index remarkably at 120mg·kg-1·d-1 in mice. This effect is owing to the phagocytosis mechanism in conjunction with macrophages. To further elucidate immunological effect of Agaricus bisporus (brown) polysaccharide, the effects of Agaricus bisporus (brown) polysaccharide on mouse macrophage RAW264.7 cells proliferation was investigated. The polysaccharide exerted a dose dependent improving effect on the proliferation of RAW264.7 cells (Figure 4). Compared with the control group, the polysaccharide increased the proliferation with 19.1% at 50µg/ml (p<0.05), and 34.5% at 100µg/ml (p<0.01). The results indicated that Agaricus bisporus (brown) polysaccharide played a promising role in improving RAW264.7 cells proliferation. The mouse macrophage-like cell line RAW264.7, is the most commonly used mouse macrophage cell line in medical research. For further investigating the effect of Agaricus bisporus (brown) polysaccharide on macrophages, the role of different dose polysaccharide in RAW264.7 cell proliferation was evaluated with MTT method. It was indicated that Agaricus bisporus (brown) polysaccharide exerted significant ameliorating effect on RAW264.7 cell proliferation, which was congruent with the result of carbon clearance in vivo. The previous report demonstrated that the Agaricus bisporus (brown) could decrease the NO production with IC50 values of less 0.1mg/ml, but not affect RAW264.7 cell viability in the tested range . This indicated that administration of low dose Agaricus bisporus (brown) polysaccharide has little effect on the RAW264.7 cell viability. It has been considered that the medical mushrooms exerted their positive impacts on human health through regulating the immune system. The anti-cancer effect of Agaricus bisporus (brown) might also attribute to its considerable immunomodulating bioactivity. This research was supported by Important Project Foundation of Tianijin China (No. 12ZCZDNC01400). Beelman RB., Royse DJ. and Chikthimmah N., “Bioactive components in Button mushroom Agaricus bisporus (J. Lge) Imbach (Agaricomycetideae) of nutritional, medicinal, and biological importance,” International Journal of Medicinal Mushrooms, 5. 321-327. 2003. Reis FS., Barros L., Martins A. and Ferreira IC., “Chemical composition and nutritional value of the most widely appreciated cultivated mushrooms: an inter-species comparative study,” Food and Chemical Toxicology, 50. 191-197. 2012. Smiderle FR., Ruthes AC., van Arkel J., Chanput W., Iacomini M., Wichers HJ., and van Griensven LJ., “Polysaccharides from Agaricus bisporus and Agaricus brasiliensis show similarities in their structures and their immunomodulatory effects on human monocytic THP-1 cells,” BMC Complementary & Alternative Medicine, 11. 58. 2011. Öztürk M., Duru ME., Kivrak S., Mercan-Doğan N., Türkoglu A. and Özler MA., “In vitro antioxidant, anticholinesterase and antimicrobial activity studies on three Agaricus species with fatty acid compositions and iron contents: a comparative study on the three most edible mushrooms,” Food and Chemical Toxicology, 49. 1353-1360. 2011. Cağlarirmak N., “Chemical composition and nutrition value of dried cultivated culinary-medicinal mushrooms from Turkey,” International Journal of Medicinal Mushrooms, 13. 351-356. 2011. Piljac-Zegarac J., Samec D., Piljac A., Mesić A. and Tkalcec Z., “Antioxidant properties of extracts of wild medicinal mushroom species from Croatia,” International Journal of Medicinal Mushrooms, 13. 257-263. 2011. Mattila P., Könkö K., Eurola M., Pihlava JM., Astola J., Vahteristo L., Hietaniemi V., Kumpulainen J., Valtonen M. and Piironen V., “Contents of vitamins, mineral elements, and some phenolic compounds in cultivated mushrooms,” Journal of Agriculture and Food Chemistry, 49. 2343-2348. 2001. Liu J., Jia L., Kan J. and Jin CH., “In vitro and in vivo antioxidant activity of ethanolic extract of white button mushroom (Agaricus bisporus),” Food and Chemical Toxicology, 51. 310-316. 2013. Jeong SC., Koyyalamudi SR., Jeong YT., Song CH. and Pang G., “Macrophage immunomodulating and antitumor activities of polysaccharides isolated from Agaricus bisporus white button mushrooms,” Journal of Medical Food, 15. 58-65. 2012. Ren Z., Guo Z., Meydani SN. and Wu D., “White button mushroom enhances maturation of bone marrow-derived dendritic cells and their antigen presenting function in mice,” Journal of Nutrition, 138. 544-550. 2008. Xu T., Beelman RB. and Lambert JD., “The cancer preventive effects of edible mushrooms,” Anticancer Agents in Medcinal Chemistry, 12. 1255-1263. 2012. Adams LS., Phung S., Wu X., Ki L. and Chen S., “White button mushroom (Agaricus bisporus) exhibits antiproliferative and proapoptotic properties and inhibits prostate tumor growth in athymic mice,” Nutrition and Cancer, 60. 744-756. 2008. Grube BJ., Eng ET., Kao YC., Kwon A. and Chen S., “White button mushroom phytochemicals inhibit aromatase activity and breast cancer cell proliferation,” Journal of Nutrition, 131. 3288-3293. 2001. Chen S., Oh SR., Phung S., Hur G., Ye JJ., Kwok SL., Shrode GE., Belury M., Adams LS. and Williams D., “Anti-aromatase activity of phytochemicals in white button mushrooms (Agaricus bisporus),” Cancer Research, 66. 12026-12034. 2006. Kanaya N., Kubo M., Liu Z., Chu P., Wang C., Yuan YC. and Chen S., “ Protective effects of white button mushroom (Agaricus bisporus) against hepatic steatosis in ovariectomized mice as a model of postmenopausal women,” Plos One, 6. e26654. 2011. Kohno K., Miyake M., Sano O., Tanaka-Kataoka M., Yamamoto S., Koya-Miyata S., Arai N., Fujii M., Watanabe H., Ushio S., Iwaki K. and Fukuda S., “Anti-inflammatory and immunomodulatory properties of 2-amino-3H- phenoxazin-3-one,” Biological & Pharmceutical Bulletin, 31. 1938-1945. 2008. Pires Ado R., Ruthes AC., Cadena SM., Acco A., Gorin PA. and Iacomini M. “Cytotoxic effect of Agaricus bisporus and Lactarius rufus β-D-glucans on HepG2 cells,” International Journal of Biological Macromolecules, 58. 95-103. 2013. Ruthes AC., Rattmann YD., Malquevicz-Paiva SM., Carbonero ER., Córdova MM., Baggio CH., Santos AR., Gorin PA. and Iacomini M., “Agaricus bisporus fucogalactan: structural characterization and pharmacological approaches,” Carbohydrate Polymers, 92. 184-191. 2013. Smiderle FR., Alquini G., Tadra-Sfeir MZ., Iacomini M., Wichers HJ., Van Griensven LJ., “Agaricus bisporus and Agaricus brasiliensis (1→6)-β-D-glucans show immunostimulatory activity on human THP-1 derived macrophages,” Carbohydrate Polymers, 94. 91-99. 2013. Dubois M., Gilles KA., Hamilton JK., Rebers PA. and Smith F., “Colorimetricmethod for determination of sugars and related substances,” Analytical Chemistry, 28. 350-356. 1956. Liu L., Jia J., Zeng G., Zhao Y., Qi X., He C., Guo W., Fan D., Han G. and Li Z., “Studies on immunoregulatory and anti-tumor activities of a polysaccharide from Salvia miltiorrhiza Bunge.,” Carbohydrate Polymers, 92. 479-483. 2013. Gunawardena D., Bennett L., Shanmugam K., King K., Williams R., Zabaras D., Head R., Ooi L., Gyengesi E. and Münch G., “Anti-inflammatory effects of five commercially available mushroom species determined in lipopolysaccharide and interferon-γ activated murine macrophages.” Food Chemitry, 148. 92-96. 2014. Gao HY., Li GY., Huang J., Han Y., Sun FZ., Du XW., An LJ., Wang HY. and Wang JH., “Protective effects of Zhuyeqing liquor on the immune function of normal and immunosuppressed mice in vivo,” BMC Complementary & Alternative Medicine, 13. 252. 2013. Singh S., Yadav CPS. and Noolvi M N., “Immunomodulatory activity of butanol fraction of Gentiana olivieri Griseb. on Balb/C mice,” Asian Pacific journal of tropical biomedicine, 2. 433-437. 2012. Borchers AT., Stern JS., Hackman RM., Keen CL. and Gershwin ME., “Mushrooms, tumors and immunity,” Proceedings of the Society for Experimental Biology and Medicine, 221. 281-293. 1999. Xu WB., Xu LH., Lu HS., Ou-Yang DY., Shi HJ., Di JF. and He XH., “The immunosuppressive effect of gossypol in mice is mediated by inhibition of lymphocyte proliferation and by induction of cell apoptosis.” Acta Pharmacological Sinica, 30. 597-604. 2009. Götlind YY., Fritsch Fredin M., Kumawat AK., Strid H., Willén R., Rangel I., Bland PW. and Hörnquist EH., “Interplay between T(h)1 and T(h)17 effector T-cell pathways in the pathogenesis of spontaneous colitis and colon cancer in the Gαi2-deficient mouse,” Intertional Immunology, 25. 35-44. 2013.